Diamond Jewellery With Precious Stones is very expensive and cannot be purchased by middle class people. They are usually preferred by rich women who usually wear them in their kitty parties, weddings and other occasions. Moreover, diamond is a sign of status and also reflects self esteem. Apart from these diamonds have their own inner meanings. We deal in all kinds of colored and white diamonds and offered diamond necklace, rings, pendants and other kinds of contemporary Jewelery design products. 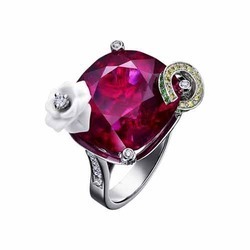 Stones like garnet, topaz emeralds, and rubies are used immensely to enhance the look of the items. 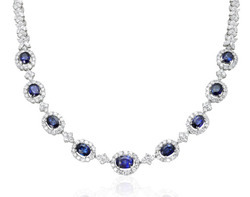 We deal in various kinds of Precious Stone Diamond Necklace of several colors and stunning designs. Our team members design outstanding and creative designs that match with any of our competitors. Diamond necklaces can be single lined, double lined or more than that. Of you want to design your own necklace then you necklace then you can give your specifications to us and we will design you the best necklace that you have ever dreamt of. Diamond necklace are suitable for all moods and you can get the traditional style necklaces to the simplest ones that are meant for regular use. 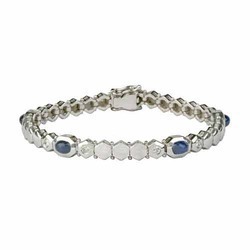 Diamond and Precious Stone Bracelets are superb and breathe taking. You can use it with your jeans and all western outfits as well as the traditional ones. They make your hands look awesome and for parties and get together diamond are the only choice that you can make, diamond bracelets are constellated with art works and embossed designing while some of them are studded with precious stones. You can make your bracelets also as you want because we make bracelets according to the specifications of our clients. Diamond Jewellery is very expensive and only high class people can afford to purchase it. Diamond is a sign of royalty and reflects the self esteem of the wearer in the society. We deals in several kinds of diamond jewelries especially diamond rings. Each of them are carefully designed and passed through several stages of testing before finally producing before the clients. We made creative products that are lined with gold and silver as well as platinum. Gemstones are also used which enhanced the beauty of the rings and gives it a stunning look. Precious Stone Diamond Rings are the perfect choice for all occasions as well as for a gift to your close people. 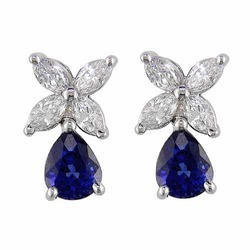 Trends may come and go but our Diamond Earrings With Precious Stones can never be an outdated style because diamonds are unmatchable against any kind of jewelry materials. Our diamond earrings are outstanding with lucrative styles and amazing colors (pink diamond, blue diamond, yellow, purple and so on) with various shapes and sizes. Our professionals are aware about the latest trend of jewelleries and they make the products so lustrous and amazing that you cannot stop yourself from purchasing them in the first glance.